A few weeks back it was hinted that Ocarina of Time 3D would be using a hint guide system and many were comparing it to the Super Guide that we saw in other Nintendo titles. The Super Guide was a plain and simple video guide where you could watch exactly what you need to do in order to complete a part of the game. This is NOT what is in Ocarina of Time 3D at all. Instead, they have a new system of hints entitled Visions. These Visions are short 5-10 second clips that have hints on what you need to do in order to overcome obstacles. This includes tips on reaching new locations, trying to solve various puzzles, and even strategies to defeat certain bosses. There are a few things worth noting about these visions and they are listed after the jump. It’s not a straight forward video guide. They are short hints, but you will still need to use your Zelda minds in order to solve the puzzles. One of the examples I remember seeing is one titled Down the Well and it consisted of several 1-3 second clips. The first one showed Adult Link talking to Guru-Guru in the Kakariko Windmill, followed by a scene of adult Link placing the Master Sword into the Pedestal of Time, and then Child Link playing the Ocarina to Guru-Guru, ending with the water being drained from the Well. The entire clip was no longer than 10 seconds, but it had several short clips and clearly gave you a hint of what you needed to do in order to access the bottom of the well. Also, the visions are not accessible right from the start and in fact, in order to view some of them, you must get to that particular point in the game. For example, there is a vision of Link battling with King Dodongo inside of Dodongo’s Cavern. This vision will not be unlocked until Link has actually reached the boss battle and attempted to defeat King Dodongo. It is after this point that this vision will become available and it will be labeled in red as New on the visions screen. After you’ve watched the vision, it will be replaced by a large green check-mark. Furthermore, once you’ve completed the goal that is shown within the vision, a green Clear will appear next to the vision on the listing. 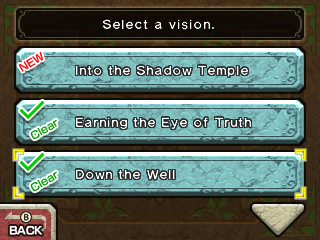 The Visions hint system can only be accessed at specific locations found in Hyrule. During my hands on with the game, the particular location I found was right in Kokiri Forest, just next to the bottom of Link’s treehouse. Right up against the wall there was a giant over-sized Gossip Stone. Once you talked to the gossip stone, you had the option to enter inside. Link then got down and crawled inside as if it was a small cave, and this brought up the visions screen. It’s unclear exactly how many visions there are in the game, but during my hands-on, I did notice that the visions were broken up by location. Based on the number of locations I saw on the listing, it sure seems like there will be quite a lot of Visions. During my time spent with the Nintendo of America representatives, they talked about this topic and mentioned specifically how it was a sensitive subject matter. Dan Owsen, who worked on Ocarina of Time for the Nintendo 64 specifically told me that this was also an issue that the developers had back in 1998. When Dan was working on the text translation he was very weary about making sure that not too many hints were provided, since he wanted to keep the player thinking on his own. The sense of accomplishment after hearing the puzzle chime in a Zelda game is something that Dan and the other Nintendo representatives valued greatly. They felt strongly that the Super Guide was not something that fit the Zelda series at all, but that the new visions system was a great middle ground for fans. 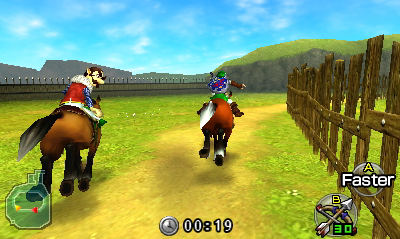 Ocarina of Time 3D Visions is one of the many new features that can be found within Ocarina of Time 3D. I personally was really shocked at how well done it was and it has even got me thinking about doing something similar here at Zelda Dungeon. It really is the perfect blend of trying to help a player, while still giving them the sense of reward for completing the puzzle. The developers really nailed this one down when making the visions guide. Ocarina of Time 3D is set to release on June 19th here in the United States and here at Zelda Dungeon we will continue to cover the game up until its release. Be sure to stay tuned later today and over the course of the next few days as we still have a ton of new Ocarina of Time 3D material to talk about. Until then, be sure to voice your thoughts of the new Visions feature by posting in the comments below!